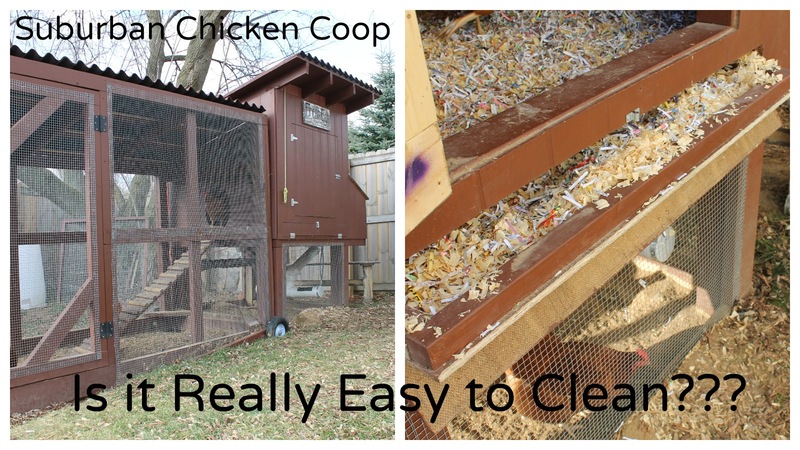 Is the "Easy-To-Clean" Suburban Chicken Coop Really Easy to Clean? Check out this video to see how easy to clean the Easy-to-Clean Chicken coop really is! When I first had the idea (well my wife had the idea), about owning chickens one of the first concerns I had was about cleaning up the mess. I remembered days of my youth when we had to shovel out the chicken coop, what a mess! Dusty, dirty, smelly, hard work shoveling manure, shavings, and pure filth! I wanted to design a coop that made this job easy and I think that I have attained that goal, what do you think? The cleanup tray is the heart of the idea with this coop. All of the chicken manure and bedding can be swept into the tray from the nesting boxes and around the edges of the coop in a matter of a few minutes. The tray is then pulled out and taken back to the compost pile to be quickly cleaned up while adding some needed nitrogen to the this fall's pile of leaves. The tray can then be returned to the coop and new shavings added, and that is it! If you have watched some of my other videos you may have noticed that I like to reuse all of our paper products that we use in our home. I use cardboard for landscaping, paper for compost, newspaper for the worm bin, paper towel rolls for trees, and everything else goes into making compressed briquettes for burning in the wood burner. I am also saving some of the paper shredding that is safe for compost for use as bedding in the coop. It is not that the pine shavings are very expensive but just another way to reuse things that we would normally ship off to recycle, and don't get me started on recycling paper! I will just say this, it is not really good for the environment. We use a lot of sand for the outdoor portion of the run but hadn't considered using it inside the coop. That would work just fine I am sure but we like to compost the chicken manure and the paper and wood shavings make this easy.